The internet of things isn't a far-off dream and the connected home is a reality today. 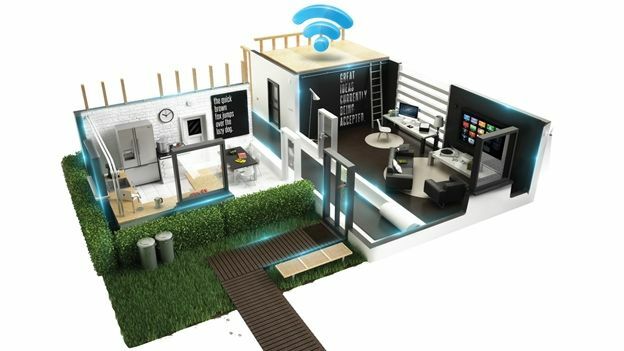 There's a host of gadgets out there which can connect to your home network, and change the way you live forever. From connected kettles to futuristic fridges, this isn't the home of tomorrow; it's T3's house of today. One of the great tech dreams has always been to control your house remotely. On a romantic evening, for instance, one might dim the lights, lower the blinds, put Phil Collins on the multi room audio system and boil the kettle ready for a post-coital cup of Nescafé, all from the day-bed. Previously, this was the preserve of yacht owners but tech know-how, ubiquitous Wi-Fi, smartphones and “the internet of things” have put it within everyone's grasp. A washing machine with an IP address, this can be commanded from your mobile wherever you are via Samsung's dedicated laundry servers. You can choose which cycle you want and how much power to use, though you will have to fill and empty the devices as usual for the foreseeable future. An altogether “cooler” kind off ridge – aha ha ha! – This has an eight-inch screen, barcode scanner, webcam and voice recognition built in. Thus it can monitor what's inside it, suggest meals for every member of the household and tell you when it's time to chuck out gone-off milk. The shire-counties mum's three-door favourite can now have its various ovens and hobs heated and turned off via iOS/Android app, SMS or the web. This does involve getting a SIM contract for a kitchen appliance, and also plugging a dedicated router into it, it must be said. This app-controlled, fixtured and-fi tted, kitchen-work-surface gourmet-level, barista-grade coffee fountain is so very exquisitely seamless that Apple has them installed in its Cupertino HQ. Just select your drink of choice from an iPad then watch the beverage magic happen. A water filter that uses UV and ozone to remove impurities is pretty good but a Wi-Fi one that reports back to your phone that it's done is even better. The Stratus tells you what nasties it's zapped, when to replace the filter and even what kind to buy, based on your local water type. It may sound like an early April Fool's joke but yes, this actually is the world's first Wi-Fi kettle. Set it boiling from the sofa via its app, or have it ask you if you fancy a brew on your return, like a spouted butler. Bonus feature: looks like an only slightly janky imitation of Heston Blumenthal's kettle. These wireless hi-fi boxes fi tin any space in your house, linking together to turn chez vous into a multi-roomed discothèque. Options go from the petite Play:1 to the Play:3pictured here to the bass-Hulk that is the Sub. All offer corking sound and control via app. Great picture quality is a given, but it's the option to adjust settings from the sofa using your mobile that makes this set special. The My Home Screen UI lets each member of the family store their favourite shows in their own personal space and share content via Wi-Fi. Not so much smart as near-genius. Lost your remote? The Sky+ app turns your Android/iOS device into one. It's useful away from the sofa, too, with a seven-day guide, the ability to search by show or actor, recommendations based on what you watch and the ability to press record from the pub. The Xbox One can all but see inside you. Its updated Kinect cam casts its futuristic gaze over your muscles, your skeletal movements and your pulse. Its facial recognition tech can pick you out in a room crowded with up to ten people, letting you make Skype calls while you're watching TV. App-control up to 50 light bulbs, remotely switching on and off, dimming and setting to any of 16 million possible colours. You can pick a mood mimicking sunrise in the morning, or use a colour – or entire colour scheme if you have multiple Hues – scanned from a favourite photo. From home security to spying on the babysitter, this camera is the cutting-edge. It records to the cloud, with all footage stored for up to seven days. View the live stream on any Wi-Fi-connected iOS, Android, Windows or OS X device. This proactive smoke and carbon monoxide detectors ends an alert to your phone if it thinks your home's in danger. Gesture control lets you silence false alarms with a wave of your hand and it also tells you exactly what to do if it really is an emergency. With no keys, no codes and no need to get up off the sofa to let people in, this scanner replaces your keyhole. Download the free app, then issue Bluetooth keys that automatically open the doors as friends/family approach. A good router is the backbone of any connected home. This one supports the latest AC dual bandWi-Fi, so you can boil your Wi-Fi kettle without sending BBC iPlayer into a buffering black hole. BT's broadband is surprisingly excellent. Fitness trackers aren't just for the gym. The Up also tracks your sleep patterns, deciding when best to drag you from your slumber with a polite vibration. Its Smart Alarm ensures you rise as refreshed as is humanly possible. This tasteful Wi-Fi connected light switch can replace your regular non-whizzy one, adding the option to schedule when you want your lights on or off, setting bedtimes for children that cannot be disobeyed. You can also turn lights on and off when you're out, fooling would-be burglars. Check the time, your email and your social network updates first thing in the morning before you even reach for your phone. The NFC-connected Smartwatch 2 pairs with most Android phones, emitting a gentle buzz when you get a call or notification. This disturbingly intelligent scale can measure your pulse and BMI as well as your mass. It then flings its findings in to the cloud via Wi-Fi for later analysis. A free app crunches the numbers into graphs that can be shared online – or not, if that seems like a bad idea. Who's the geekiest of them all? Why you are, the moment you install the Seraku Washbasin. An Android OS is splashed across the mirror at the back of the basin, displaying your daily dose of news, weather and traffic info. No danger of smudging as it's all gesture controlled. Aid your in-shower serenading with this water-resistant Bluetooth speaker, which is also a 60-hole showerhead. It can connect to devices up to ten metres away and has a battery life of seven hours, recharging via USB. This telly is impervious to shower spray, humidity and toothpaste, so no matter what you throw at it the show will go on. Screen sizes go from 19 to 40 inches, each with a built-in Freeview tuner and waterproof remote control that can survive a dunk in the bath. Once plumbed into your bathroom's water supply, these “faucets” connect easily to your Wi-Fi. You can then control water temperature and how deep you'd like your bath to be filled via a free app (iOS only at present). King of the commodes, lord of the lavs, this hi-tech toilet boasts various automatic sprays and “treatments”, intelligent flushing that tracks your motion – no, not that motion – and deodorising mechanisms. It's the embedded Bluetooth speakers that really make this a throne fit for the tech loving gods, though. Go that step further than controlling your boiler by micro managing each room's radiator. Create up to 12temperature zones and turn-up individual radiators when you need to dry your socks. As a gardener, you may already talk to your houseplants, but now they can talk back. Stick this into the soil and it sends alerts to your phone about moisture, fertilizer and light levels. Like Parrot's device on a wider scale, this conducts discussion with your whole garden. Sensors placed around your yard link to a base station that keeps track of PH, water and air temperature, light and humidity. Out in 2014.